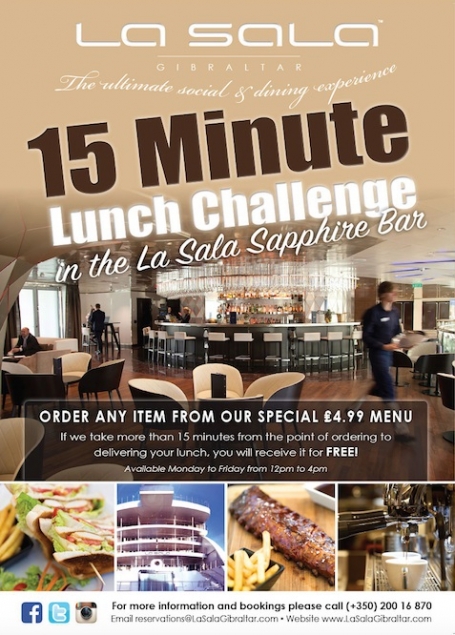 The 15-Minute Lunch Challenge was launched at La Sala Gibraltar on July 28, 2015! Read on to find out more! Challenge the cooks of La Sala Gibraltar to serve your lunch in the course of 15 minutes* (the offer applies to the £4.99 menu). If the cooks don't make it, your meal is FREE! La Sala is renowned for its ability to deliver international cuisine, extensive wine and cocktail lists, and first-class entertainment. This is confirmed by their loyal clientele which regularly includes celebrities and renowned sports stars. To book your table for lunch or dinner, please call on +350 2001 6870 or mail at info@lasalagibraltar.com. La Sala Gibraltar is also taking online bookings via www.lasalagibraltar.com.